One of the best gifts I’ve received as a cancer patient was from my husband. 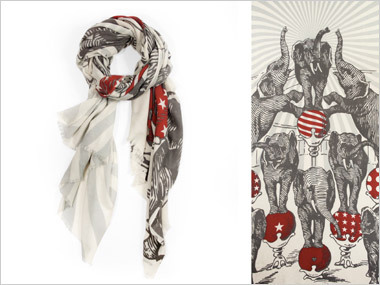 I’d fallen for an impossibly lovely scarf by We Are Owls. It was a circus theme and the one I chose had a pyramid of elephants on it. It is light, warm and impossibly soft and I feel wrapped in luxury whenever I wrap it over my shoulders. I bring this up because today I’ve had my fourth whole brain radiation treatment and my head hurts and feels burned, even while it is cold outside. Having soft things around, things that are pretty, makes things easier. I once joked that the cashmere goat was sometimes a cancer patient’s best friend. I still believe that, at least in the winter.